How time flies! Another General Conference is upon us together with all those opportunities which listening to the Lord’s counsel brings us. We hope that you each find reinforcement, strength, comfort, and guidance as you listen to the conference messages. We would specifically encourage you to review carefully those messages which the First Presidency and the Twelve present. As apostles, they each have specific insight and gifts, together with their stewardships, that make their remarks the most important to implement in our lives. Then we can use these messages to help guide us for the next six months. As is the case with each April General Conference, we also have the opportunity to attend the All Italian Missions Reunion on the preceding Friday night. Unfortunately that night we will be with some our grandchildren and children out of state which means we’ll miss the reunion. We never-the-less encourage you to attend the reunion and gather either in the gym or find an unused room. You are also welcome to send us an email about who you were able to see and what news was shared. Given that we will not be at the reunion we want to share some other items with you that will hopefully also be of interest. This is a critical election year in the United States. While we have strong personal feelings about candidates and issues, we hope that you will each become informed and prayerfully participate if you are an American citizen. If you are not a U.S. citizen your prayers in our behalf as a nation will certainly be appreciated. There is so much yet to be done before the Savior returns and having the cooperation of many governments and peaceful environments will more likely allow the Gospel blessings to be shared with more of Father’s children each day. The most common questions of course are when will the temple be completed and when will the open house and dedications be held? Unfortunately, until the First Presidency makes a public announcement we won’t know for sure. So don’t buy any non-refundable tickets  The best dates we’ve heard are in 2014 which will allow all four of the buildings and the supporting construction to be completed. There is a Church website located at http://tempiodiroma.chiesadigesucristo.it/rome-temple-details.html which shows a schematic of the temple site which includes the large bus parking area and all the buildings and gardens. Not clearly readable in the lower right corner, near the adjacent soccer fields, is a marked and somewhat triangular area. This will be a solar farm which will generate electricity for the entire complex and which the government is thrilled to see on such a project, as are we. Given all these facilities the extra time will be required. Let me mention something else that we hope you find both interesting and faith promoting. On the above site (www.ldschurchtemples.com) there is a Church video of the temple complex (temple, arrival center to house visitor’s, stake center, and visitor’s center which will hold a family history library). As you watch the YouTube video, the visitor’s center is shown with a copy of Thorvaldsen’s “Christus” statue. We have been told that not only will there be a copy of this statue, but of the original Twelve that he did while living in Rome in the 1800s. Here is a small part of a Wikipedia entry on the Church of Our Lady in Denmark where the originals are (You can look up his name and this article should you wish to learn more. There are also pictures of the statues that we are talking about.). The Church of Our Lady (Danish: Vor Frue Kirke) is the cathedral of Copenhagen and the National Cathedral of Denmark. It is situated on Vor Frue Plads and next to the main building of the University of Copenhagen. The interior is likewise decorated with the twelve apostles (one in front of each of the piers of the central nave), the Risen Christ displaying the wounds in his body (in a niche above the altar) …, all in Italian carrara marble. All of these sculptures were completed in Rome by the famous Danish sculptor Bertel Thorvaldsen. We understand that the visitor’s center copies will also be made out of Carrara marble. For those who finished their mission while we were still in Rome and therefore are not familiar with Tuscany, this is a city and quarry about 40 miles NW from where the Pacini family is from near Lucca in Toscana just off the coast. It is a famous marble that has been used in sculptures such as Micheangelo’s David (there is also a Wikipedia article on Carrara marble should you be interested). In addition to these statues, we’ve been told an interesting story about how the statues will be reproduced. The Church has been granted permission to do updated digitization of the originals by the Danish government. As a result the statues at the Rome Temple Visitor’s Center will have significantly more detail when they are carved than even that which we see in the North Visitor’s Center on Temple Square in Salt Lake City. We’ve heard a comparison between these new statues and the existing Christus statues throughout the world as being the difference between a regular and high definition picture on a TV. What a wonderful blessing that will be! We’re sure that the many thousands of Italian and other visitors from around the world will appreciate these wonderful art works done by a man that had evidently been blessed with a significant gift to do such work. And to think that these statues are now in a very real sense coming home to Rome – che gioia! Another news worthy item, at least for the Pacini’s, is that President and Sister Pacini together with Ashley and Chelsea have been granted Italian citizenship based on President Pacini’s grandfather having been born in Italy. It took a number of years to obtain this second citizenship and we are all pleased to have one more tie with those whom we came to love so dearly as a result of our service in Italy. While having dual citizenship won’t have many actual advantages associated with it, it is still meaningful for us to strengthen those ties that bind us to the mission field and those we love. On occasion we are able to visit with some of the members in Italy thanks to modern technology. How grateful they are for each of you and the thousands that have preceded you. Please know that your efforts have had an eternal impact that will only be visible once we can view this earth-life in its entirety from a heavenly perspective. And that leads us to our last thoughts. We want you to all know how much we continue to appreciate your service in Italy. We hear occasionally from some who have now grown and matured and who have regrets about not having done as much as they now know was possible during their missionary service. Please remember that we realize that each of you did your very best at that time and in those circumstances. Your efforts and faith have brought about many of these miraculous events that have occurred in such a short time since your service. We appreciate you all and continue to pray for your success and well-being. We see your successes and efforts and hope that you will leave behind any feelings of inadequacy. Now is the time to use the lessons learned as you contribute in ever increasing ways throughout the world. We also hear from time-to-time of great successes and occasionally of devastating tragedies. We rejoice in those times of success and happiness and pray for the divine influence of the Comforter to be with you in those times of distress, loss, and sadness. May the Lord continue to bless and guide each of you! You are always in our prayers. Come vola il tempo! Un’altra conferenza generale e’ arrivata insieme a quelle opportunita’ che ascotare il consiglio del Signore ci portano. Speriamo che ognuno di voi trovera’ forza, comforto, guida, e rafforzamento per aver’ascotato I messagi della conferenza. In particolare, vi preghiamo di ripassare con attenzione I messagi della Prima Presidenza e I Dodici. Come apostli ognuno di loro ha delle perspettive e doni specifici che ci possono benedire in maniere davvero eterni. Dopo aver’ascoltato ai discoursi, questi messagi ci possono guidare per I prossimi 6 mesi. Com’e’ il caso con ogni conferenza generale in Aprile a Salt Lake City, abbiamo anche l’opportunita’ di frequentare la riunione dei missionari ritornati da tutte le missioni italiane. Questo si terra’ sul venerdi’ precedente. Sfortunatamente, noi saremo via quel weekend in visita ad alcuni dei nostril nipotini e figli fuori lo stato di Utah. Quindi non ci saremo. Pero’ vi consigliamo di partecipare se fosse possibile. Potete riunirvi o in una stanza vuota o nel centro dove saranno “I biscotti ” Considerate anche la possibilita’ di mandarci un email con dettagli della sera e le notizie che avete sentito in merito a Italia, or I nostril colleghi missionari, o altro. Per quanto riguarda l’indirizzo e tempo della riunione, e’ gia’ scritto sopra nella parte inglese. Dato che non ci saremo alla reunione cogliamo l’opportunita’ di condividere alcune cose che speriamo avranno merito. Questo e’ un anno d’importanza per le elezioni negli Stati Uniti. Anche se noi abbiamo delle preferenze forti su vari candidate e aurgomenti, se siete cittadini American vi esortiamo di informarvi sugli argomenti e con preghiera partecipare. Se non lo siete cittadini americani, abbiamo bisogno delle vostre preghiere. C’e’ ancora tanto da fare prima che il Signore possa ritornare. E avere il sostegno dei vari governi e una pace maggiore nel mondo ci fornira’ con una possibilita’ piu’ grande a condividere le benedizioni del Vangelo con sempre piu’ figli del nostro Padre Celeste. Le domande pui’ frequente sono sempre quando tutto sara’ costruito e auando si terra’ l’”open house” o la dedicazione? Sfortunatamente fino al tempo che la Prima Presidenza dichiara tali periodi, non possiamo sapere per sicuro. Quindi, non comprate biglietti di viaggio dove non possono essere cambiati fino a quell tempo. Le date che sento piu’ frequentamente sono durante l’anno 2014 che dara’ tempo per il lavoro di finire su tutte e quattro gli edifici e le altre strutture annunciate. C’e’ anche un sito web ufficiale a http://tempiodiroma.chiesadigesucristo.it/rome-temple-details.html che dimostra un piano del sito incuso la zona grande dove si puo’ parcheggiare I pulman, tutti gli edifici e giardini. Non e’ molto chiaro ma in piano sul angolo giu’ e destro c’e’ una zona piutosta triangulare. Questo sara’ una zona di raccolta solare che fornira’ eletricitta’ per il complesso. Sia il governo che noi siamo molto felici per tale disegno. Per motive della complessita’ del sito, ci vorra’ tutto il tempo sopranotato. Lasciate che vi informiamo di un altra cosa che speriamo sara sia interessante e che promuovera’ la vostra fede. Sul sito web sopra notato (www.ldschurchtemples.com) c’e’ un video del complesso del tempio con tutti I quattro edifici (tempio, ostello, centro di palo, e un centro visitatore che contiene in piu’ un centro genealogico). Mentre seguite il YouTube video, il centro visitatore e’ dimostrato con una coppia della scultura chiamata “Christus” dal scultore danese Thorvaldsen. Abbiamo sentito che ci sarano pure I dodici apostali originali con Paolo invece di Juda, fatto anche da Thorvaldsen che lui fecero mentre viveva a Roma nel 19o secolo insieme alla statua di Cristo. Abbiamo coppiato una piccola parte da Wikipedia sulla chiesa dove esistono le statue originali (potete cercare di piu’ sul internet se vi interessa). Se qui non vedete le fotografie, potete andare al sito Wikipedia in ingles con l’argomento “Church of Our Lady” che dimostra anche delle fotografie delle statue di cui stiamo parlando. Abbiamo sentito che pure le statue al centro visitatore saranno fatto di marmo da Carrara. In piu’ di capire che queste statue forse ci saranno, c’e’ una storia interessante su come saranno riprodotte. Il governo Danese ha dato alla chiesa il permesso di fare degli imagini digitali con una qualita’ molto superiore a quella esistente (la tecnologia non conosco solo il risultato). Quindi, le statue nel centro visitatore a Roma saranno molto piu’ dettagliati che quelli al centro visitatore su Piazza del Tempio a Salt Lake. Come paragona e’ detto che I dettagli sulle statue sono piu’ come TV di alta definizione che TV normale. Che grande benedizione sara! Sono sicuro che migliaia di visitatori dal mondo apprezzerano questi capolavori fatto da un uomo che e’ stato chiaramente benedetto dal Signore con questi talenti. Poi a considerare che queste statue saranno “di nuovo in casa a Roma” e davvero bello considerare. Un’altra notizia d’importanza, almeno per I Pacini, e che Presidente e Sorella Pacini sono diventati cittadini italiani insieme a Ashley e Chelsea per motivi della discendenza di Presidente Pacini e suo nonno Giovanni Nello Pacini. Ci volevano parecchi anni sistemare tutto ma siamo lieti essere collegati in piu’ con quelli dalle quali abbiamo sentito cosi’ tanto amore durante il nostro servizio in Italia. Anche se essere doppi cittadini non porta tante vantaggi attuali, e sempre importante per noi rafforzare I legami fra noi e coloro con la quali abbiamo servito nel campo missionario. Grazie alla tecnologia moderna di tanto in tanto siamo in grado a communicare con alcuni membri della chiesa in Italia. Che gioia che ci porta sentire I loro voci e spiriti anche da una distanza! 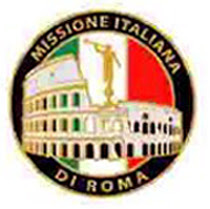 Ci esprimano spesso quanto sono grati per il lavoro missionario che avete fatto insieme a migliaia di altri missionari. Sappiate che I vostri sforzi hanno avuto un impatto eterno che sara’ possibile vedere completamente solo quando abbiamo la possibilita’ vedere questa vita terrena nella sua pianezza da una perspetiva celestiale. Quello ci porta ai nostri pensieri per concludere. Sappiate quanto apprezziamo il vostro servizio in Italia! Ogni tanto sentiamo da qualcuno che con il passaggio di tempo ha pensieri di rimpianto perche’ pensa di non avere fatto tutto il possibile durante la missione. Ricrodatevi che a quel tempo avete fatto e datto il vostro meglio e noi siamo di quel parere che avete dato il vostro meglio. Oggi vedete forse con occhi diversi. I vostri sforzi e fede hanno contribuito a creare gli eventi miracolosi che vediamo adesso in Italia dopo cosi’ poco tempo dal periodo del vostro servizio. Vi apprezziamo tutti! E continuiamo a pregare per il vostro successo e ben’essere. Noi vediamo I vostri successi nel campo missionario e speriamo che lascerete in dietro qualsiasi pensiero di mancanza. Oggi e’ il tempo di utilizare le lezioni imparate a contribuire ancora di piu’ nel far crescere il lavoro del Signore dapertutto il mondo. Di tanto in tanto sentiamo anche di grandi successi vostri e anche di tragedie. Gioiamo in quei tempi di successo e felicita’ and preghiamo per l’influenza divina del Consolatore di starvi sempre vicino in quei tempi di disaggio e tristezza. Possa il Signore continuare a benedirvi tutti insieme al Suo lavoro in Italia. Rimanete sempre nelle nostre preghiere.